Researchers who are developing biochips are taking two distinct approaches in devising ways to shunt tiny amounts of liquids around. One focuses on finding ways to form microscopic channels and tiny mechanical pumps. The other is aimed at using electricity to maneuver tiny droplets on surfaces. Researchers from the University of Texas M.D. Anderson Cancer Center have advanced the second approach with a programmable biochip that uses an array of electrodes to place water droplets on a surface, insert substances into the droplets, and move and merge the droplets. The device contains no moving parts. The droplets, which range from 20 to 500 microns in diameter and 0.5 to 65 nanoliters in volume, serve as carriers for samples, contaminants, chemical reagents, viral and genetic material, and cells. A nanoliter is one millionth of a milliliter, and there are about 5 milliliters to a teaspoon. The device makes it possible to automate biochemical analysis and detection to, for instance, identify pathogens in the field. The biochip and its computer controller could eventually be miniaturized and incorporated into portable medical, biological and chemical diagnostic devices, said Jon Schwartz, a research scientist at the University of Texas. "A long-term goal of this research is to provide a fluidic processor technology that can form the core of versatile, automated, microscale devices [for performing] chemical and biological assays at or near the point of care," he said. This will "increase the availability of modern medicine to people who do not have ready access to modern medical institutions." The biochip contains a 32-by-32 array of electrodes. When energized, electrodes attract water droplets that are suspended in a thin film of liquid hydrocarbon. The principle behind the droplet biochip is dielectrophoresis. Small electrically polarized particles or droplets that are suspended in a less polarized medium are attracted to nearby electric fields like those produced by electrodes. Water droplets are naturally polarized because water molecules are not electrically symmetrical; the arrangement of atoms leaves one end of the molecule positive and the other negative. Droplets can be moved and merged simply by sending electrical current to the right sequence of electrodes. By programming electrodes in various sequences, multiple droplets can be moved around the chip and merged to mix their contents. 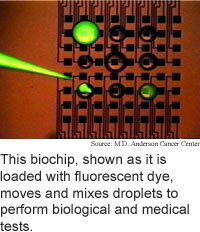 Droplets are placed on the biochip from liquid-filled pipettes positioned just above the chip's surface. The fluid pressure is kept just below the level needed to flow onto the surface. Turning on an electrode positioned beneath a pipette produces enough force to draw fluid out. The size of a droplet depends on how long the electrode remains on. Biochips that manipulate droplets on surfaces have several advantages over those that control fluids in channels, according to Schwartz. Droplet biochips can be easily programmed, whereas channel-based biochips are hardwired for a more specific range of tasks. Mechanical pumps and valves are also difficult to make at the microscale and are prone to wear. Other researchers have produced biochips that sandwich droplets between two surfaces. The University of Texas researchers' single-surface approach prevents samples and reagents from coming into contact with the surface and so limits the risk of contamination, said Schwartz. Droplets can also be made in a wider range of volumes, and using water droplets as containers shields samples and reagents from the heat and electric fields produced by the electrodes, he said. The programmable droplet biochip opens the possibility of producing specific DNA and RNA sequences and proteins on the spot. "The ability to mix droplets containing individual nucleic acid bases... would enable oligonucleotides to be synthesized on-the-fly in situ and used immediately in a diagnostic or pathogen-detection mode," said Schwartz. Producing a new oligonucleotide or protein could be as simple as downloading the right sequence of bases from the Internet, he added. The ability to mix droplets also makes it easier to create chemical reagents as they are needed, which could make biological testing safer and cheaper. "Detection and analysis problems frequently involve the use of toxic reagents or unstable precursors [that] are undesirable or impractical to transport and store," said Schwartz. The ability to carry out a set of programmable reactions autonomously makes it possible to synthesize substances on-the-fly from a set of less toxic or reactive reagents, he said. The researchers tested the device by inserting droplets containing varying amounts of bovine serum albumin into droplets of o-phthalaldehyde on the biochip. They measured the fluorescence of the droplets to determine the relative concentrations of the protein. The researchers are working on a prototype that is scheduled to be finished in the first half of 2004, according to Schwartz. They are aiming to have a miniaturized, fully-automated device available for field testing within two years, he said. Schwartz's research colleagues were Jody V. Vykoukal and Peter R. C. Gascoyne. The system's hardware and software components were developed by Lawrence Livermore National Laboratories, the University of California at Davis, LynnTech, Inc. and AppliedMEMS, Inc. The work appeared in the first quarter 2004 issue of Lab on a Chip. The research was funded by the Defense Advanced Research Projects Agency (DARPA). Related Elements: Technical paper, "Droplet-Based Chemistry on a Programmable Micro-Chip," Lab on a Chip, first quarter 2004.